Within all animal cells, the lysosome functions as the sanitation department: it digests, recycles and disposes of such materials as worn-out organelles and engulfed bacteria and viruses. A membrane seals off the lysosome's acidic environment, preventing its enzymes from harming the rest of the cell. 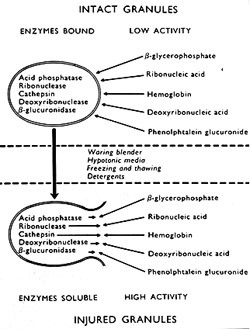 One of these enzymes, acid phosphatase, provided Christian de Duve (1917- ) with a clue that led him, in the early 1950s, to discover the lysosome entirely by biochemical methods. With electron microscopy, de Duve and colleagues then imaged lysosomes in cell fractions. This basic discovery underlies the current understanding of several inherited disorders caused by defective lysosomal proteins, including Tay-Sach's disease and Gaucher's disease. 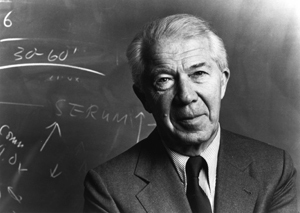 For his "discoveries concerning the structural and functional organization of the cell," de Duve received the Nobel Prize in 1974, shared with Albert Claude (1899-1983) and George E. Palade (1912-2008). A serendipitous observation set de Duve on the path to the lysosome. Following a long interest in insulin, he was studying the metabolism of carbohydrates in the rat liver in 1949, when he turned to the methods of cell fractionation by differential centrifugation pioneered by Albert Claude at Rockefeller. As he later wrote, "All we wanted was to know something about the localization of the enzyme glucose 6-phosphatase, which we thought might provide a possible clue to the mechanism of action, or lack of action, of insulin on the liver cell." They found first that glucose 6-phosphatase was associated with microsomal particles, and could serve as a marker for that organelle. They also noticed that another enzyme, acid phosphatase, was hardly detectable with fresh cell homogenates but present in large quantities after further processing. This led them to hypothesize that this phantom enzyme was sealed in a sac, or membrane, that could break and release it. As they analyzed the distribution of several enzymes in cell fractions, de Duve and coworkers developed refined fractionation techniques and also investigated and extended the method's theoretical underpinnings. By 1955 the group had identified four additional hydrolytic enzymes—enough evidence to propose the existence of a new group of particles, or organelles, which they called lysosomes. Collaborating with Alex Novikoff, they made electron micrographs of the lysosome-rich fractions in which the particles appeared as "dense bodies, surrounded by a membrane." de Duve's group continued to develop methods and instruments for cell fractionation. de Duve later discovered another organelle—the peroxisome—which contains enzymes that metabolize fatty acids in most eukaryotic cells. In 1974 de Duve founded the International Institute of Cellular and Molecular Pathology at the Catholic University of Louvain, a biomedical research institute modeled on The Rockefeller University, with the goal of translating basic discoveries into medical advances. It was renamed the de Duve Institute in 2005. de Duve's interests in the last two decades have turned to the origin and evolution of life, and he has authored three books on this subject (see Further Reading below). Christian René de Duve received the MD from the Catholic University of Louvain (1941). He pursued further training in chemistry, and then in biochemistry, spending 18 months in the Stockholm laboratory of Hugo Theorell (Nobel Prize, 1955). He then went to the Washington University School of Medicine, where he collaborated for six months with Earl Sutherland (Nobel Prize, 1971) in the laboratory of Carl and Gerty Cori (Nobel Prize, 1947). In 1947 de Duve joined the faculty of the Catholic University of Louvain, and became, in 1951, professor and head of the department of physiological chemistry. In 1962 he was appointed professor at The Rockefeller University, and for decades maintained laboratories in both New York City and Louvain. In addition to the Nobel Prize (1974) de Duve's achievements have been recognized with the Francqui Prize for Biological and Medical Sciences (1960) and the Heineken Prize for Biochemistry and Biophysics (1973). He became emeritus at the University of Louvain in 1985 and at Rockefeller in 1988; he remained president of the ICP until 1991.